A penny-sized rocket thruster may soon power the smallest satellites in space. The device, designed by Paulo Lozano, an associate professor of aeronautics and astronautics at MIT, bears little resemblance to today’s bulky satellite engines, which are laden with valves, pipes and heavy propellant tanks. 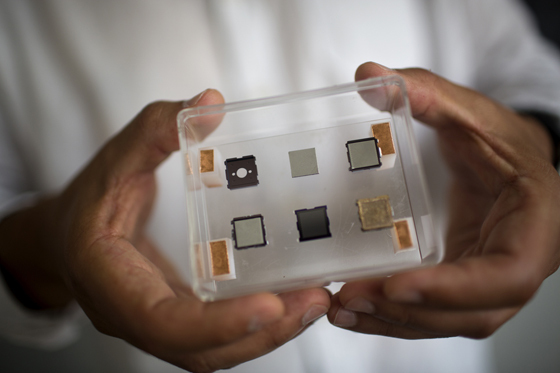 Instead, Lozano’s design is a flat, compact square — much like a computer chip — covered with 500 microscopic tips that, when stimulated with voltage, emit tiny beams of ions. Together, the array of spiky tips creates a small puff of charged particles that can help propel a shoebox-sized satellite forward.